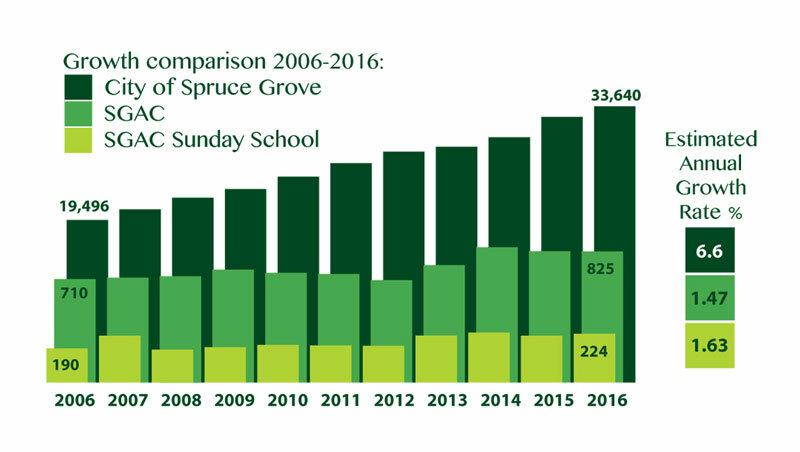 Spruce Grove Alliance Church seeks to build a spiritual home for the people of Spruce Grove and Parkland County. To meet the needs of today, and to enable us to support our growing communities into the future. Phase 1 of this project is designed to allow our congregation to expand our Christian education, children’s ministry and small group activities. Larger, purpose-built space will allow us to reach more children, youth and families by expanding programs which are currently limited by the capacity of the building, and by adding new programs. Improve the curb appeal of the church – creating a more welcoming first impression for those who are seeking a spiritual home. A foundation of Biblical learning and faith is being built every Sunday as more than 250 kids participate in Sunday School. That strong Christian Education goes well beyond Sunday morning – through our active Bible studies, discipleship programs and classes, adults of all ages are growing in their faith, and new believers are introduced to our Saviour. As these programs often happen at the same time, we simply don't have space to expand – and in some cases, are actually turning people away. Likewise, new opportunities to reach children, youth and adults in our church and broader community have been identified, but we are limited by our current physical space and cannot take on new programs. Furthermore, our current facility is over 40 years old and in need of major renovations; many of which can be bypassed with the completion of Phase 1. This includes the replacement of the roof on the back portion of the church (which is already showing signs of weakness), and the removal of the portables, which are well beyond their estimated life cycle, and starting to disintegrate. If the future development project does not proceed, hundreds of thousands of dollars will need to be spent in the coming years to keep Spruce Grove Alliance in its current state. As of November 25, 2018, $1.25 million in cash, and an additional $800,000 in pledges has been generously committed towards our $6 million project goal. We've also recently begun the "Laying the Groundwork" goal of $750,000 to prepare the site for construction. You can read more about it here! Please pray, asking God to direct your role in this project, and to guide your giving. And make your gift to the future of Spruce Grove Alliance Church today! Still have Questions or Concerns? Visit our FAQ Page to reach out to the Future Development Team and to see the answers to questions already asked!